China's anti-monopoly investigation into foreign car manufacturers has spread to Toyota. 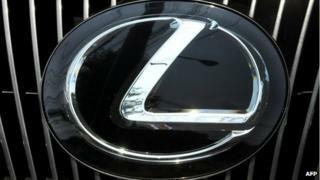 The Japanese company said that Chinese regulators were looking into its Lexus luxury brand. Audi, Chrysler and Mercedes-Benz are among carmakers and parts suppliers already under scrutiny for as-yet unspecified anti-competitive issues. A Toyota spokesman said the company was "co-operating fully with the queries from the authorities on Lexus". Although regulators have not set out the basis of their concerns, there have been reports in China of customers complaining about the high prices of imported vehicles and spare parts. The technology and pharmaceutical sectors have also faced investigations in what analysts have said looks like an attempt to force down prices. The BBC's correspondent in Shanghai, John Sudworth, said that there was a feeling of vulnerability among foreign companies in China. "Multinational corporations, some observers suggest, make convenient political scapegoats for a government keen to show it is fighting for the consumer and tackling abuses of corporate power," he said. The investigations are being led by China's National Development and Reform Commission (NDRC), which earlier this week raided a Mercedes office in Shanghai. According to state news agency Xinhua, "inspectors are still collecting evidence and investigating whether Mercedes-Benz has used monopolistic tactics". Last month, China's State Administration for Industry and Commerce - the body responsible for enforcing business laws - said it was looking into "alleged monopoly actions" by US tech firm Microsoft.